Believe it. 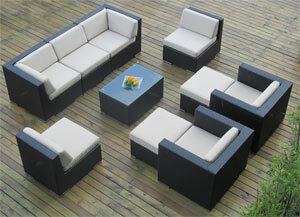 Click, buy and turn your backyard into a great room. 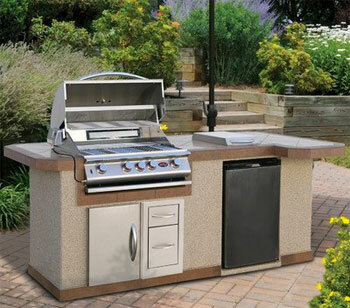 This outdoor kitchen includes a gas grill, cooler drawer, lots of counter space and – wait for it – a bar-height table on the opposite side for eating, drinking and entertaining. With a finished countertop, stucco exterior and stylish shade pergola, no design decisions need to be made here – except where to put it. This outdoor kitchen does not come with a pergola, but it has pretty much everything else you need, including a top-notch gas grill, matching stainless steel refrigerator, storage cabinets and a spacious elevated countertop for eating and entertaining. It’s well-designed with upgraded features and noticeable finishing touches like the under-counter LED lighting and sophisticated slate-tile countertop. 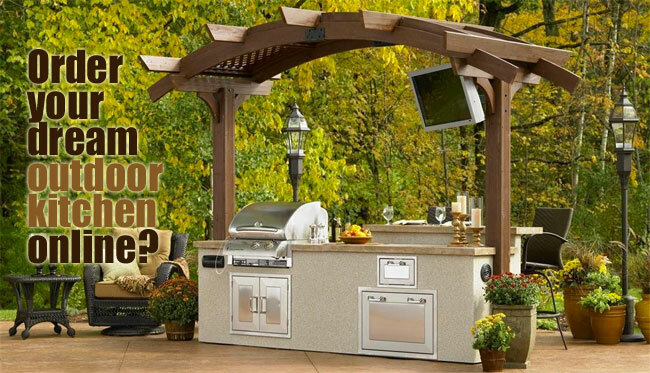 This is no regular outdoor kitchen, though. It has a 4-speaker sound system built into it. Hello. You’ll never want to go back inside again! The CalFlame BBQ Island is similar to the St Martin above, but without the elevated back countertop, LED lighting, stereo, etc.. It also costs less. About $2,000 less. There is plenty of counter space (800 square inch cooking surface), and this complete kitchen comes with both grill and fridge. Therefore, if you already have an outdoor sound system, the lighting you need and a dining area, this might be the better option for you. 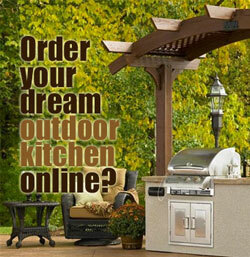 If you want to design or build your own custom outdoor kitchen, this book is very helpful. It includes photos that are great for coming up with ideas for your own layout, building materials and kitchen style. 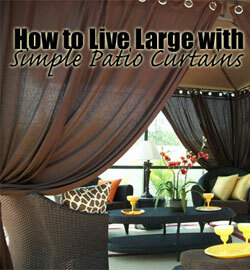 You also get some great design, layout and construction tips that you might not have considered. Knowing this information in advance of starting your project typically ends up saving homeowners money, time and headaches during the building process.